Don’t let the long, hot Louisiana summer get you down — there’s plenty to do in New Orleans in August. These five happenings are a testament to our willingness to eat, drink, dance, mingle, strut, and even run — in the heat, humidity, and that inevitable afternoon rain. From brass bands to block parties to a parade to running in a fancy dress for a good cause, August has got something going on every weekend, spilling into the first week of September. 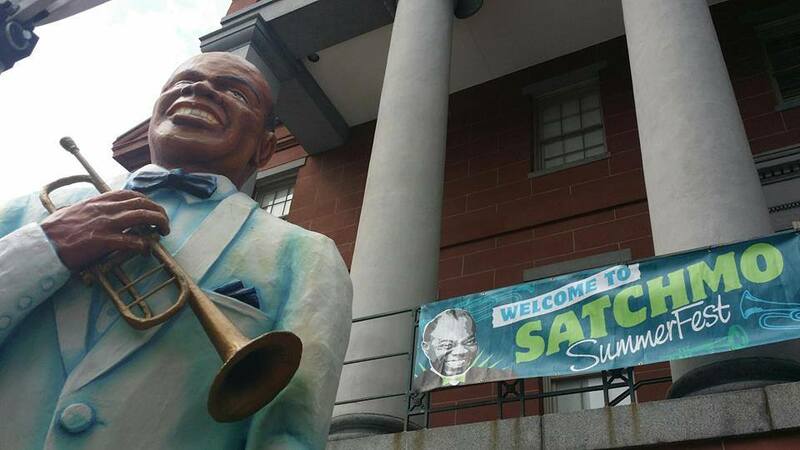 Satchmo SummerFest, named so after one of Louis Armstrong’s nicknames, started as a tribute in 2001, on Armstrong’s 100th birthday. It has been traditionally held on the first week of August and marked by strong attendance. The three-day festival is back this year to its original location at the U.S. Mint at the foot of Esplanade Avenue, after last year’s switch to Jackson Square. Produced by the nonprofit French Quarter Festivals, Inc., Satchmo SummerFest will have music all weekend on its two outdoor, tented stages on the Mint’s grounds, plus dance lessons and demos on the dance floor located on the Mint’s second floor. This popular art event is held on the first Saturday in August in the Warehouse District, centering around the galleries on Julia Street. The 300-700 blocks of Julia Street will be closed off for a block party, with three stages for live music and dozens of food and drink stands (25 restaurants are expected to participate this year). About 20 galleries on and around Julia St. will be open to the public. Started in 1994 in an attempt to attract visitors to that revived area (now known as Arts District New Orleans), White Linen Night has been growing steadily, attracting more visitors and vendors every year. Help the White Linen Night live up to its name by wearing white, though this is decidedly optional, as there’s no dress code. Check the CAC event website or Facebook page for updates and a full list of participating galleries. Where: Starts at Crescent Park, 1008 N. Peters St.
Red Dress Run isn’t exclusive to New Orleans, but the local participants take it up a notch by costuming on top of wearing their best and/or most outlandish red dress, regardless of gender. This is an annual fundraiser run for local charities organized by hashing groups (adults-only, non-competitive social running clubs) all over the world. They call themselves “drinking clubs with a running problem” and the local group, New Orleans Hash House Harriers (NOH3), is no exception. All proceeds from the run will go directly to local charities, according to NOH3. You can check a full list of charities here. You can also register online. Cost varies depending on how early you sign up. The few rules to be aware of, if you plan to participate: Registration fee is cash-only on the day of the event. A red dress is a must, no exceptions. And you must be 21 to participate, because the alcohol will be flowing. Dirty Linen Night, as you may have guessed, takes after another annual art event, White Linen Night. It follows the White Linen Night exactly one week after, on the second Saturday in August. It is similar in format, though looser in structure and spanning more territory. The multi-block party takes over the 200-1000 blocks of Royal Street and some cross streets and adjoining areas in the French Quarter, including Jackson Square and Dutch Alley. About 40 galleries are expected to participate this year, plus a number of shops and restaurants. What started as a going-away party in the early 70s has evolved into an immensely popular annual event that attracts participants from all over the world. It’s considered the fifth largest event in New Orleans after Mardi Gras, Jazz Fest, Essence Festival, and French Quarter Festival. There will be a free show/block party at the corner of Bourbon and St. Ann Streets and two parades. Both parades will take place in the French Quarter. A lot of events are free and open to the public. You can purchase a VIP Weekend Pass online for access to all events that do charge an entrance fee and may sell out. « Previous: So Much Fun Can Be Found Right on the Mississippi River!